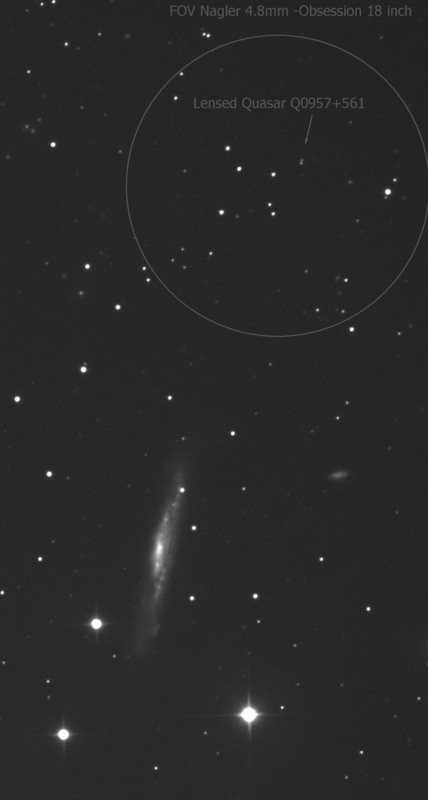 This field contains the bright galaxy NGC 3079 in Ursa Major along with the 17th mag lensed double quasar Q0957+561. The quasar is over 7 billion light years away at a redshift of 1.41, with a separation of only 6 arc seconds between the mirrored images. The tiny pair of dots is one of a few known gravitationally-lensed quasars. The source is actually a single quasar over 7 billion light years away. The light from this object passes around a giant elliptical background galaxy (not visible) with redshift 0.36 or 3.9 billion light years away. This close encounter causes the light to bend and form into two separate images as shown above. Quasars are the most luminous known objects in the universe. They are thought to be the high-energy cores of distant active galaxies, with their energy provided by matter-energy conversion as matter is sucked into giant black holes. This quasar is easy to find since it lies just a few arc minutes North of bright galaxy NGC 3079.